When a camera's lens captures light and reflects it, the light bends in appropriate ways, depending on the angle of the viewer. This is similar to how your eyes work: when you tilt your head up, your eye sees things differently than if you look straight ahead, although you may not notice it because your brain has learned to accommodate for the perspective change. The two photos below demonstrate this principal: the first photo illustrates how your eye may see the buildings if you tilt your head up. 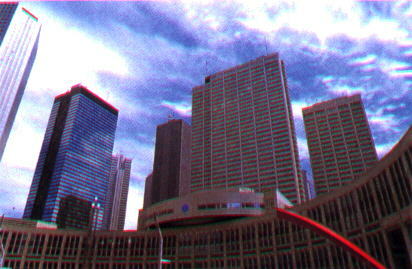 The second photo shows what the buildings would look like if you kept your head level, looking straight ahead. The whole idea behind perspective control lenses is to simulate this effect. This first picture was taken with a normal 35mm camera using a conventional 50mm lens. The buildings are slanted and bent due to lens having to point up to capture them on film. This "convergence" is due to the shape of the lens and what it does to light when placed at certain angles with respect to the film plane. This second picture was taken with the same camera standing in the same spot using a perspective control lens. That is, the lens can move independently of the camera body. 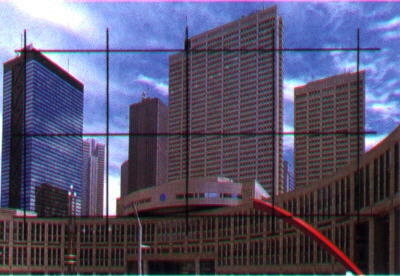 Here, instead of tilting the entire camera upwards to catch the entire view of the buildings, the camera remains level so that the film plane is parallel to the buildings. To get them into view, the lens is moved up without tilting upwards. That is, it "rises", but remains parallel to the film plane, which remains parallel with the fronts of the buildings (which are assumed to be perpendicular to the ground). This shifts more of the top part of the cone of vision created by the lens onto the film. The center of the view is not in the center of the image, but closer to the bottom of the image, where your eye would be if you were looking straight ahead. While the difference is subtle, the effect is dramatic. The superimposed grid demonstrates how you can keep horizontal and vertical lines straight. Perspective Control (PC) lenses can move up or down ("rise" or "fall") in the manner described so they can adjust the view of the scene to give greater control over what actually hits the film without the effects of distortion. In addition to the up and down movements, they also have tilt capabilities, which allow the lens or the film back to tilt at angles, in all directions. Tilting the angle of the lens with respect to the film plane adjusts the plane of focus, but not the actual view. This allows for greater depth of field for a scene whose main subject may be elongated in one dimension, but not another. For example, one could photograph the length of a wall that's very long, but the photography does not need to capture much height. Without tilt capabilities, the photographer would have to stand far from the wall and be parallel to itthat is, the film and the lens planes are the same as the plane of the wall. As soon as you move towards one end of the wall, the angles of the film and lens planes become greater and greater, relative to the fixed position of the wall. In order to keep the entire wall in focus, the photographer must "stop down" by making the aperture smaller and smaller. The smaller the hole in the lens, the more depth of field can be achieved, but there are limits to how far you can go. If you want to stand inches from the corner of the wall and capture the entire wall in focus, a normal lens may not be able to do the job because the aperture can't get small enough. But, the problem can be solved if the film or lens plane remains parallel to the wall, even though the camera itself might not be. Thus, by tilting the lens, you can adjust the plane of focus so that the entire length of the wall is in focus without moving the camera.